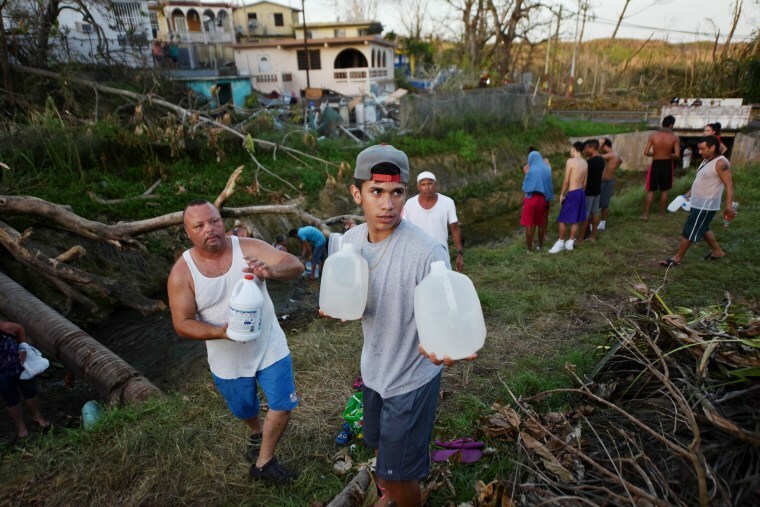 Nearly half of Puerto Rico’s 3.4 million residents still lack potable water one week after Hurricane Maria wreaked havoc on the island, officials reiterated Wednesday — as locals literally scrambled to stay alive. About 44 percent of the Puerto Rican population remains without drinking water, the Department of Defense said in a statement Wednesday. “Given the changing scope and conditions, DoD will adjust its concept of operations in Puerto Rico and transition from a short term, sea-based response to a predominantly land-based effort designed to provide robust, longer term support to [the Federal Emergency Management Agency] and [to Puerto Rico]," the statement, from Defense Department spokesman Army Lt. Col. Jamie Davis, read. Meanwhile, many locals said they were struggling to find safe drinking water and increasingly worried about a looming public health crisis in the U.S. territory. “This paradise has turned into hell lately in the last couple of days,” said Gregorio Cortés, a doctor from Carolina, Puerto Rico, by phone on Wednesday. “Pharmacies and supermarkets are starting to close because they don’t have enough diesel supply to keep running so people are having less and less opportunity to find drinking water and food or supplies, he said. Cortés said many on the lived in worry about where they would find their next supply of water for themselves and their families. “That’s everyday life for us now,” he said. People sometimes travel long distances after hearing a particular store still had drinking water and food left, only to leave empty handed, he added. In the northern municipality of Bayamón, mother Betsy Chilea described looking for water for her children. "It's very hard because we don't have anything," she told NBC News. When asked if she had seen federal aid in the area, she said, "No! Not anything. Don't see anything." Cortés, who is father to a 7-year-old and 3-year-old, said that even for families who have had their running water restored, there is major risk that it is not clean enough to drink because of contamination. “We’re boiling the water and after we boil it we are filtering it and especially since I have small kids we worry about them and their safety,” he said. There are more than 8,800 federal staff, including 600 FEMA workers, on the ground in Puerto Rico and the U.S. Virgin Islands aiding recovery efforts after Hurricanes Irma and Maria, FEMA said Wednesday. The agency said it has provided more than 6.5 million liters of water, 4.4 million meals and 70,000 tarps, among other supplies, to the islands since Maria first made landfall. President Trump has said he will visit the area next Tuesday. Related: What Is the Jones Act, the Law Some Say Hurts Puerto Rico? "I will be going down to Puerto Rico next week to get an on the ground briefing about the disaster recovery and to see all of our great first responders and to be meet a lot of the people who were so affected by these storms," he said from Indiana on Wednesday. "We are with you now, I tell them, and we will be there every step of the way until this job is done. It is truly catastrophic what happened in Puerto Rico." But even with federal and local aid trickling, residents in San Juan and throughout Puerto Rico still lacked basic necessities and some said the public health risk was mounting. Puerto Rico Gov. Ricardo Rosselló said Wednesday evening that the island was working to meet the needs of its people while facing a major disaster. "You have to understand that this is a devastation of an enormous magnitude, that our grid, our energy grid is completely destroyed," he told MSNBC's Chris Matthews on "Hardball." "We are on an island so getting resources over here has been a rate-litigating step so we're working on it we’re delivering food and water, we're making sure diesel gets to the people," he added. Isabel Rullán, co-founder and managing director of ConPRmetidos, a non-profit group, said even if people have running water, they may not have the power or means to boil or purify it. The non-profit, which focuses on fostering personal, social, and economic development of Puerto Rican communities, is raising money for long-term relief efforts. “This is a big problem," she said by phone Wednesday. Rullán's office in San Juan had only recently gotten its running water back, but the situation was still critical in many areas, she said. "We’re in San Juan which is one of the least affected areas and they were still very much affected," she said. Rullán, who lives in the northern municipality of Guaynabo, said her own building lacked running water and power. She was given water by neighbors after the hurricane hit because there was none left in the nearest supermarket. "There’s so much contamination right now, there’s so many areas that are flooded and have oil, garbage in the water, there’s debris everywhere,” she said by phone. “We’re going to have a lot of people that are potentially and unfortunately going to get sick and may die,” she said. The Department of Defense said Wednesday that 59 of the 69 hospitals were “operational with unknown status.” FEMA also said it had delivered fuel to 19 hospitals for power generators. Still, doctors and locals have described rising concern over the availability of diesel to power life-saving equipment. Hurricane Maria has been blamed for at least 18 deaths in the territory. “This is what’s going to happen with the water, people are going to start getting sick and then there’s not enough space in the hospitals,” Rullán said. CORRECTION (Sept. 17, 2017, 10 p.m.): An earlier version of this article misstated how much water FEMA has provided to residents of Puerto Rico. The agency has provided more than 6.5 million liters of water, not 6.5 liters.